Emerging from British origins in 2006, Secbands became the preferred supplier of wristbands & lanyards for accreditation in South Africa. We have now evolved into a Proudly South African company. Today our expansion has developed into new markets and countries – we now manufacture our lanyards which enable us to supply small quantities. We also have the fastest laser-engraving machine in South Africa which specialises in metal products like water bottles, thermal mugs, keyrings, pens and USBs. We engrave on wood and glass, specialising in Cutting & Biltong boards, Coasters and much more. We believe that merely satisfying our customers is not enough to earn their loyalty; instead they must experience exceptional service worthy of their repeat business and referral. We are proud to announce that our near perfect score of repeat orders from our rapidly expanding customer base shows we are doing something right. Nothing is more humbling than being held in high regard. In our business, we seek to have a profound effect on our customers, their clients and indeed our own staff and families; we stick together in tough times and support where we can. We support a variety of campaigns all of which are close to our heart. 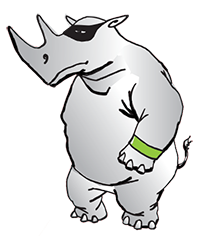 Our motif is Wristy the Rhino; none of us want to see this majestic beast disappear from our world on our watch. Our involvement includes sponsoring and supporting Stop Rhino Poaching, Saving Private Rhino and others. On the human front we support a variety of campaigns comprising HIV/AIDS testing, Cancer Awareness, School Development and Brain Tumour Awareness. We have also linked ourselves to the Sunflower Fund for Bone Marrow donorship and the Out of Africa program. We enjoy taking basic useful products like Lanyards, Pens, Keyrings, Cutting and Biltong boards or Coasters and then weaving our Secbands branding magic through engraving or printing and creating an awe inspiring product for the client. Whilst always professional, our staff are fun and friendly which makes every day more enjoyable for everyone. We believe work should not be a drudgery but fun, uplifting and inspirational ! We try to do all of this with a tongue in cheek sense of humour and fun. In turn we seek like-minded clients…so if you are serious, staid and boring please stay away ! Who knows what the future holds…we have done our 1/3/5 year plans but the future is an exciting unknown. Whilst there is much to do and perfect at Secbands, we strive to ensure that ‘Customer Service’ is not a department but everyone’s job. Congratulations, you made it to the end ! So now you know a bit about us…put us to the test we are waiting to prove the above is not just words.